Given the controversy that surrounds Tyler, the Creator at every turn, it wasn't likely the safest move for Mountain Dew to recruit the Odd Future rapper to direct a series of commercials. That project has inevitably resulted in some angry viewers, as one of the advertisements has been denounced for its alleged racism and misogyny. The commercial, which you can watch below, shows an injured woman attempting to point out her attacker from a line of suspects while a detective drinks Mountain Dew. Most of the suspects are black males (from the Odd Future crew) except for the character of Felicia the Goat, whose quotes indicate that he's guilty. 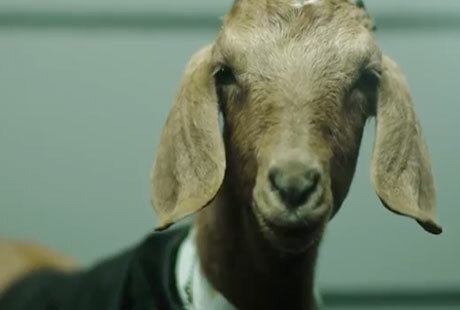 The commercial is a continuation of another ad in the series, in which the goat attacks a woman in a restaurant. Tyler tweeted, "IDIOTS THE LADY IN THE NEW MOUNTAIN DEW COMMERCIAL IS THE WAITRESS THAT GOT ATTACK RETARD." As NBC Los Angeles [via Pitchfork/AllHipHop.com] reports, social commenter Dr. Boyce Watkins wrote an article about the ad for Your Black World, calling it "arguably the most racist commercial in history." In response, the commercial has been removed from Mountain Dew's website and from Odd Future's YouTube channel. The Associated Press notes that the ad was never intended to be on television, but PepsiCo's consumer relations team discovered that some viewers found it offensive. PepsiCo has reportedly apologized for the controversy. UPDATE: Sorry, the commercial has been pulled down. UPDATE 2: As you can see from the tweet below, now Tyler has asked Dr. Boyce Watkins to have a conversation with him about the whole controversy. Also, his manager Christian Clancy has wrote a lengthy letter in Tyler's defence, which you can read here.